Pilate went outside again and said to the people, "I am going to bring him out to you now, but understand clearly that I find him not guilty." Pilate knew the truth, but couldn't bring himself to live by it! Jesus was innocent. He said it again and again. The problem was he wouldn't live up to what he knew was true. For Christians, Pilate was a hideous and weak ruler, catering to the will of the mob rather than following his conscience. 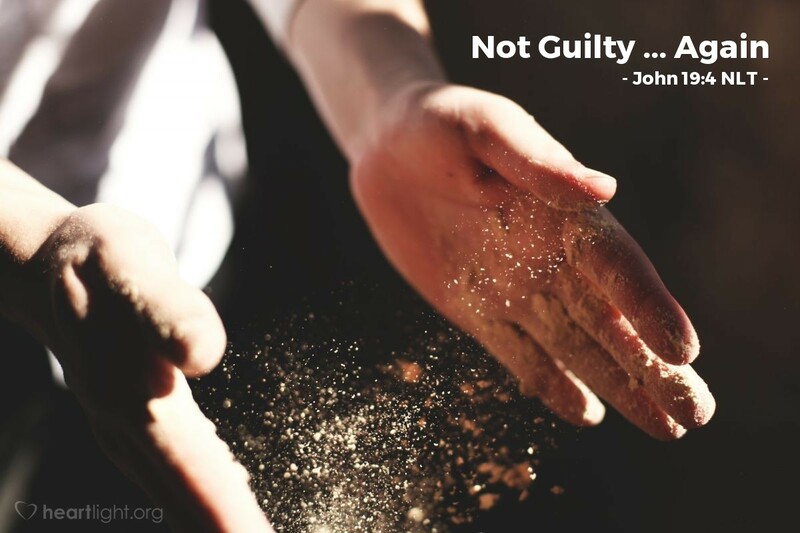 Yet before we rake Pilate over the coals, let's be honest with ourselves about all the times we have not lived up to what we knew was right, honest, true, or honorable because we didn't want to go against the will of the crowd around us. God forgive us, and the indwelling Holy Spirit help us to be more courageous in the future. Forgive me, dear LORD my heavenly Father! I still struggle with knowing how to be courteous and not cave in to the pressures around me to conform to a worldly standard rather than living out my faith. Please give me courage, wisdom, and a proper sense of timing to live with integrity and grace wherever your path for me may lead. In Jesus' name. Amen.